I was going to go to the park by Tewkesbury Abbey to get some pictures of mine for Saturday Siblings this week. Unfortunately, it absolutely chucked it down on both my days off and I’ve been swamped with exam marking as it is that time of year – so no time or opportunity for delightful shots with the beautiful abbey as a backdrop. The only pictures I have managed have been fairly dull and poorly lit. However, I just happened to pick up my phone and snap this corker. 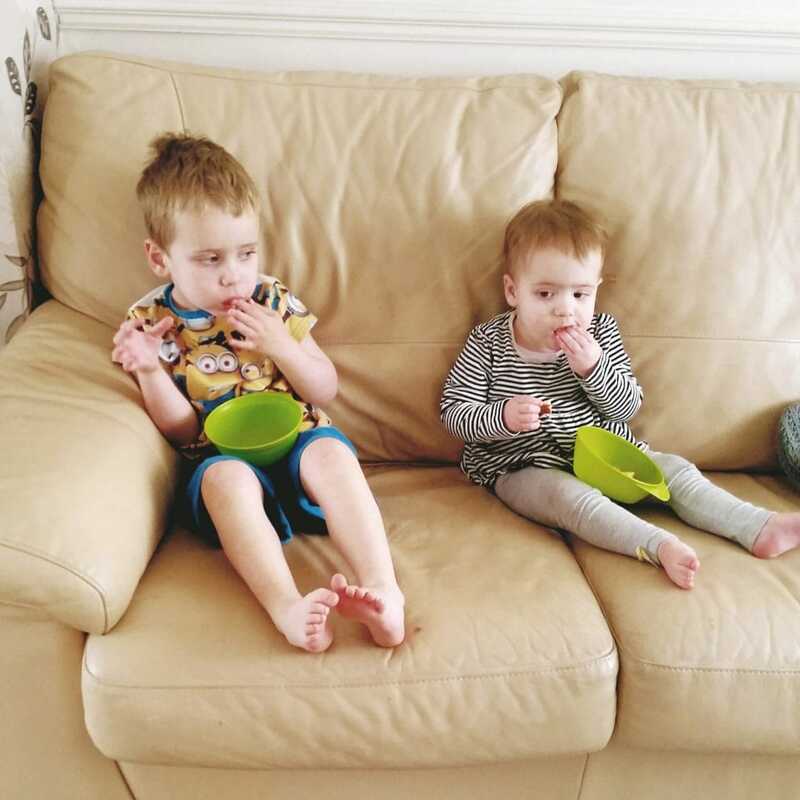 They were engaged in their mid-morning snack and I caught them both stuffing their faces at exactly the same time and, by chance, their poses and stuffed cheeks were almost identical. It did make me laugh when I checked the gallery. So I decided to use it. It’s also my turn to choose our featured images this week. 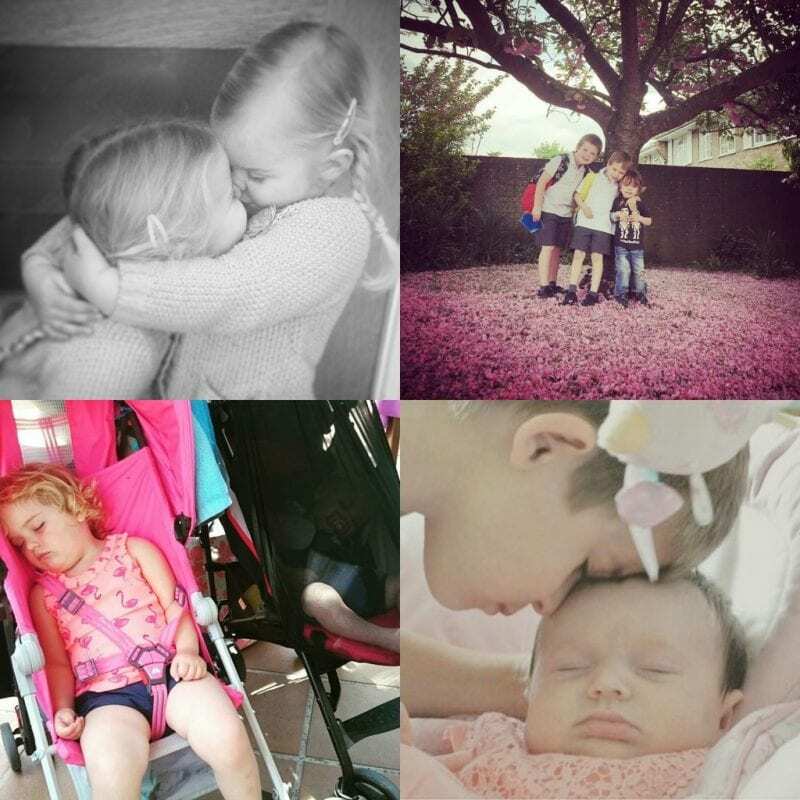 We were so overwhelmed by the amusing, touching and beautiful images you shared – choosing only four was pretty tough. My first choice is the beautiful image from Laura at Five Little Doves of her daughters hugging. The caption of her post is ‘Love, a thousand times over’ and that sums it up perfectly. You can follow Five Little Doves on Instagram. My second chosen image is from Gemma at Life is Knutts. She managed to get this beautiful shot of all three of her boys under the glorious blossom – and there was only minimal toddler petal-consumption. Parent Blogger win. You can give her some love on Instagram here. Next up is Fran from Whinge Whinge Wine for achieving the holy grail of multiple pre-schooler parenting – the double nap. I haven’t achieved this since February 2015 when my son dropped his afternoon snooze. Sad times. Head over to Instagram and follow there if you like what you see. Finally, another absolutely breath-taking shot from Jane at Our Little Escapades. Another photograph that represents the purest of love – just beautiful. You can also follow ourlittleescapades on Instagram too. Thanks so much to all our featured posters and to everyone who took part last week. Harriet and I love looking through your pictures and we can’t wait to see more next week. They do look so similar, a perfectly timed photo.